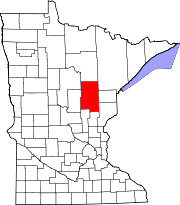 Aitkin (/ˈeɪkɪn/ AY-kin) is a city in Aitkin County, Minnesota, United States. The population was 2,165 at the 2010 census. It is the county seat of Aitkin County. Due to the importance of regional trade at Lexington, the route of the Northern Pacific Railroad was planned to pass near there. Aitkin was founded in 1870 when the Northern Pacific Railroad was extended to that point, replacing and annexing Lexington. The city and county were named for William Alexander Aitken, a partner of the American Fur Company and chief factor of the company's regional operations in the early 19th century. The development of industries attracted people to the town. In the late 19th and early 20th century, a massive wave of immigrants, mostly from present-day Ireland, Germany, and Scandinavian countries, moved into the Aitkin area to work in the logging and riverboat industries. They were able to start working before they had learned much English. After the Great Depression and World War II, the logging industry declined. The area developed as a farming community, based on production of cattle and poultry, which continued until the late 1970s to early 1980s. A creamery  and a turkey plant were important to the town's economy. With the decline of small family farms in agriculture, many abandoned farms can be seen throughout the county. By the 1990s, Aitkin had changed again, developing as a community for retirement and tourism, especially with its lake areas. The tourism and service industries are central today. Health care, education, human services, and non-profit organizations are some of the major contributors to the modern-day Aitkin economy, along with the hospitality industry. Aitkin has been affected by occasional flooding of the Mississippi River. Major notable floods had reached past 20 feet (6 m), such as the 1950 flood, and nearly 19 feet (6 m), such as the summer flooding in 2012. The 2012 flood was one of the first floods that overflowed into the lake areas, flooding the cabins, since it was caused by heavy rainfall instead of melting snow. Five properties in Aitkin are listed on the National Register of Historic Places: the 1901 Patrick Casey House, the 1902 Potter/Casey Company Building, the 1911 Aitkin Carnegie Library, the 1916 Northern Pacific Depot, and the Aitkin County Courthouse and Jail (built in 1920 and 1915, respectively). According to the United States Census Bureau, the city has a total area of 2.20 square miles (5.70 km2), all of it land. The Mississippi River flows through at the northern edge of Aitkin. The Ripple River and Sissabagamah Creek both flow nearby. As of the census of 2000, there were 1,984 people, 892 households, and 434 families residing in the city. The population density was 1,150.3 people per square mile (445.4/km²). There were 969 housing units at an average density of 561.8 per square mile (217.5/km²). The racial makeup of the city was 97.33% White, 0.15% African American, 1.31% Native American, 0.25% Asian, 0.05% Pacific Islander, 0.35% from other races, and 0.55% from two or more races. Hispanic or Latino of any race were 0.76% of the population. 30.4% were of German, 16.6% Swedish, 12.3% Norwegian and 6.5% Irish ancestry according to Census 2000. There were 892 households out of which 22.5% had children under the age of 18 living with them, 36.5% were married couples living together, 9.8% had a female householder with no husband present, and 51.3% were non-families. 46.5% of all households were made up of individuals and 30.2% had someone living alone who was 65 years of age or older. The average household size was 2.03 and the average family size was 2.90. In the city, the population was spread out with 20.8% under the age of 18, 7.5% from 18 to 24, 21.6% from 25 to 44, 17.6% from 45 to 64, and 32.4% who were 65 years of age or older. The median age was 45 years. For every 100 females, there were 76.2 males. For every 100 females age 18 and over, there were 69.8 males. The median income for a household in the city was $47,574, and the median income for a family was $58,071. Males had a median income of $50,577 versus $31,641 for females. The per capita income for the city was $26,471. About 7.1% of families and 9.2% of the population were below the poverty line, including 11.0% of those under age 18 and 20.9% of those age 65 or over. Riverboat Heritage Days - the first weekend in August. The Aitkin County Fair - annually at the middle of July since 2008. Moonlight Madness - around Labor Day weekend. County Road Classics Fly-In Drive In takes place on the last Sunday in June. In 2018, the date was changed to Father's Day. World Famous Fish House Parade takes place on Black Friday, the day after Thanksgiving. This event was noted in a 2003 documentary which aired on the Home and Garden Channel in the United States. The Aitkin Municipal Airport is located at the northeast side of the city of Aitkin. The following routes are located within the city of Aitkin. American film actress and singer Judy Garland performed at the opera house in Aitkin as a young child. A small display related to Garland can be found in the converted opera house, now The Butler Building, in downtown Aitkin. ^ "City of Aitkin Minnesota". City of Aitkin Minnesota. Retrieved October 16, 2012. ^ "Guide to Aitkin Minnesota". www.lakesnwoods.com. Retrieved 20 August 2017. ^ Mitchell, Samuel Augustus. Map of Minnesota and Dakota. Philadelphia: Charles Desilver. 1859. ^ Upham, Warren (1920). Minnesota Geographic Names: Their Origin and Historic Significance. Minnesota Historical Society. p. 14. ^ "Profile for Aitkin, Minnesota, MN". ePodunk. Retrieved October 16, 2012. ^ "Minnesota National Register Properties Database". Minnesota Historical Society. 2009. Retrieved 2017-01-29. ^ "Weatherbase: Historical Weather for Aitkin, Minnesota". Weatherbase. 2011. Retrieved on November 24, 2011. ^ "Aitkin Public School District". Aitkin Public School District. Archived from the original on October 23, 2012. Retrieved October 16, 2012. ^ "Opera House". Butler’s – Aitkin, MN. Archived from the original on May 31, 2013. Retrieved October 14, 2012. The Aitkin Carnegie Library is a Carnegie library in Aitkin, Minnesota, United States. It was built in the Classical Revival style. It was listed on the National Register of Historic Places in 1982. The building now houses the Jaques Art Center. Aitkin station in Aitkin, Minnesota, United States, is a brick passenger depot built on the Northern Pacific Railway mainline in 1916. The rail line is now part of the BNSF Railway. The depot symbolizes the importance of the railroad in Aitkin's growth and development.The railroad line was initially built in 1871. By the early 1900s, Aitkin was emerging as the region's leading supply center, and the old wood-framed depot was considered grossly inadequate. The railway started construction of the new brick depot in 1915. It was built in the Mission Revival style with cut-stone trimmings and a German tile roof. Passenger traffic ended in the 1960s. The station was listed on the National Register of Historic Places in 1982 as the Northern Pacific Depot. The building is now occupied by the Aitkin County Historical Society as the Depot Museum. Exhibits focus on the heritage of Aitkin County, including riverboating on the upper Mississippi, Native American culture and immigrant pioneers. Bethlehem Lutheran Church (also known as Swedish Evangelical Lutheran Bethlehem Church) is a historic Lutheran church in Nordland Township, Minnesota, United States. The church was constructed in 1897 by Swedish immigrants. The Gothic Revival building features a square tower topped by a belfry and an octagonal spire. The church's congregation formed in 1891 and was the second of five Swedish Lutheran churches established in the county. Aitkin County received a large influx of Swedish immigrants in the late 1800s, and the church is one of the best-preserved buildings constructed by the immigrant population upon their arrival.The church was added to the National Register of Historic Places in 1982. The Cuyuna Range is an iron range to the southwest of the Mesabi Range, largely within Crow Wing County, Minnesota. It lies along a 68-mile-long (109 km) line between Brainerd, Minnesota, and Aitkin, Minnesota. The width ranges from 1 to 10 miles.Though covered by Pleistocene glacial drift up to 200 feet thick, 1859 surveyors noted compass deflection while in the area. The range was surveyed by Cuyler Adams, using a dip needle in 1895. With partners, he located ore by drilling in 1903. The word "Cuyuna" is an amalgamation of the first three letters of Cuyler's name with "Una", the name of his dog.The Kennedy mine shaft reached ore in April 1908 and the first shipment was made via rail on 11 April 1911. Open pit mining started at the Rowe mine in 1912. In addition to the iron, the ore was rich in manganese, which was useful during World War I, with 32 mines operating.At the height of the mining, the Cuyuna Range was the location of the worst mining disaster in Minnesota, the Milford Mine disaster. On February 5, 1924, a new tunnel was blasted too close to nearby Foley Lake, and water rushed in, killing 41 miners.Mining on the range continued until 1984. Also like the Vermilion Range, mining slowed as it became more economical to extract taconite deposits from the Mesabi Range, which were closer to the surface. Additionally, the surface mines were safer than the mines deep underground. Cuyuna Country State Recreation Area now occupies portions of the range where mining pits and rock deposit stockpiles were left behind by the miners. The Cuyuna Lakes Trail is also located near the former mines. Dale Keith Lueck(born October 30, 1949) is a Minnesota politician and member of the Minnesota House of Representatives. A member of the Republican Party of Minnesota, he represents District 10, which includes all of Aitkin County and part of Crow Wing County in the northern part of the state. Gordon William McKay (March 17, 1910 – October 26, 1990) was an American politician and businessman from Oregon. He was a Republican who served two four-year terms in the Oregon State Senate. In the senate, McKay represented a large rural district in Central Oregon. While serving in the state senate, he was a champion of tax relief and helped modernize the state's criminal code. In the private sector, he was president of a title insurance company in Bend, Oregon. Jean Keene (October 20, 1923 – January 13, 2009), also known as the Eagle Lady, was a former rodeo trick rider who became the subject of national attention due to her feeding of wild bald eagles on the Homer Spit in Homer, Alaska. Although she had many supporters for the feedings, she was also criticized for drawing a large population of eagles to the area. After her death, the city of Homer passed a law prohibiting the feeding of predatory birds. John Poston (born May 1958) is an American politician and member of the Minnesota House of Representatives. A member of the Republican Party of Minnesota, he represents District 9A in north-central Minnesota. Jonathan Edwards (born July 28, 1946) is an American singer-songwriter and musician best known for his 1971 hit single "Sunshine". KKIN-FM (94.3 FM) is a Classic Country formatted broadcast radio station licensed to Aitkin, Minnesota, serving Aitkin and Aitkin County, Minnesota. Established in 1972, KKIN-FM is owned and operated by Jimmy D. Birkemeyer's R & J Broadcasting. KKIN (930 AM) is an adult standards formatted broadcast radio station licensed to Aitkin, Minnesota, serving Aitkin and Aitkin County, Minnesota. Established in 1961, KKIN is owned and operated by Jimmy D. Birkemeyer's R & J Broadcasting. Northeast Aitkin is an unorganized territory in Aitkin County, Minnesota, United States. The population was 11 at the 2010 census. Northwest Aitkin is an unorganized territory in Aitkin County, Minnesota, United States. The population was 342 at the 2010 census. The Potter/Casey Company Building is a historic commercial building in Aitkin, Minnesota, United States. It was built in 1902 to house the expanding business of Aitkin County's leading retailer and to lease office space to other businesses on the second floor. It was listed on the National Register of Historic Places in 1982 for having local significance in the theme of commerce. It was nominated for representing Aitkin County's most successful commercial enterprise at the turn of the 20th century. Robert K. Kerlan (May 13, 1922 – September 8, 1996) was an American orthopedic surgeon and the co-founder, along with Dr. Frank Jobe, of the Kerlan-Jobe Orthopaedic Clinic. He was regarded as a pioneer in the discipline of sports medicine.Kerlan was the Los Angeles Dodgers' first team doctor after their move from Brooklyn to Los Angeles in 1958, and diagnosed Dodgers pitcher Sandy Koufax with traumatic arthritis in his left elbow. He also became team physician for other Los Angeles-based sports teams including the Rams, Lakers, and Kings.Kerlan remained active in his sports medicine practice despite a long-standing case of arthritis that required him to use crutches periodically for years, and permanently after 1977.Education Kerlan graduated from Aitkin High School in Aitkin, Minnesota, where he was a star athlete. He started college as a basketball letterman at UCLA, but eventually gave up playing. He graduated from Stanford Medical School in 1948 with Dr Toby Freedman. He then completed his residency with Toby in 1951 at the USC Medical Center under the direction of Dr. Max Gaspar. Kerlan died in Santa Monica, California at age 74 in 1996. The cause of death was variously reported as heart failure and pneumonia. WZFJ is a radio station airing a Contemporary Christian music format licensed to Breezy Point, Minnesota, broadcasting on 104.3 MHz FM. The station serves the areas of Brainerd, Minnesota and Aitkin, Minnesota, and is owned by Minnesota Christian Broadcasters, Inc.
Warren William (born Warren William Krech; December 2, 1894 – September 24, 1948) was a Broadway and Hollywood actor, immensely popular during the early 1930s; he was later nicknamed the "King of Pre-Code". Dr. William John Dehning (August 13, 1942 - June 23, 2017) was an American conductor, teacher, and author who spent almost his entire career in the collegiate realm. He was known primarily for his work as conductor of the University of Southern California Thornton Chamber Choir and as author of the book, Chorus Confidential: Decoding the Secrets of the Choral Art, published in 2003. Under his leadership, the Thornton Chamber Choir won seven prizes in international European competitions, including Grand Prizes in Varna, Bulgaria and Tours, France. After winning the choral competition with the USC Chamber Choir in Bulgaria, Dehning was awarded the Judges' Conducting Prize by a panel of ten judges in 1999. During his tenure, the ensemble also appeared at American Choral Directors Association (ACDA) conventions six times, including nationals in 2001 and 2005. They also completed a tour of East Asia in 2006, performing at the National Concert Hall in Taipei. While at Northern Michigan University from 1970–1972, Dehning was the founder of the Marquette Choral Society, which is still active. Later, he was from 1985-1995 the founder/conductor of the California Choral Company, a semi-professional chamber chorus that attained a reputation in Europe as well as in the United States. As Chairman of the USC Department of Choral Music (now retired), Dehning was awarded the first annual Dean’s Faculty Award for Excellence in Teaching, and he was also the 2007 recipient of the Thornton School's Ramo Award. Dehning was one of four founding members of the National Collegiate Choral Organization (NCCO), which held its first national conference in San Antonio in 2006.